1. Gal Ed—170 headstones from the Old Cemetery in Prague. Printed by Moshe HaLevi Landau, Prague 1856. 2. Lot of 6 books bound together: Bat Yiftach, Shivchei HaAri, Brachot Menachem, Otzar HaHayyim, Hanhagot Adam, and Khochmat HaYad. Warsaw 1859. 3. Lot of 6 books bound together: Yesh Nochalin, Matok MiDvash (light green pages), Yishrei Lev. 4. Seder HaNikkud, by Rabbi Yosef Yafeh. Vilna 1867. 5. Milot HaHigayon, by the Rambam. Warsaw 1865. 6. Bechinot Olam, by Rabbi Yedaya HaPnini. Vilna 1856. 7. Tzohar HaTeiva HaChadash, by Rabbi Shlomo Zalman Hene. Vilna 1873. 8. 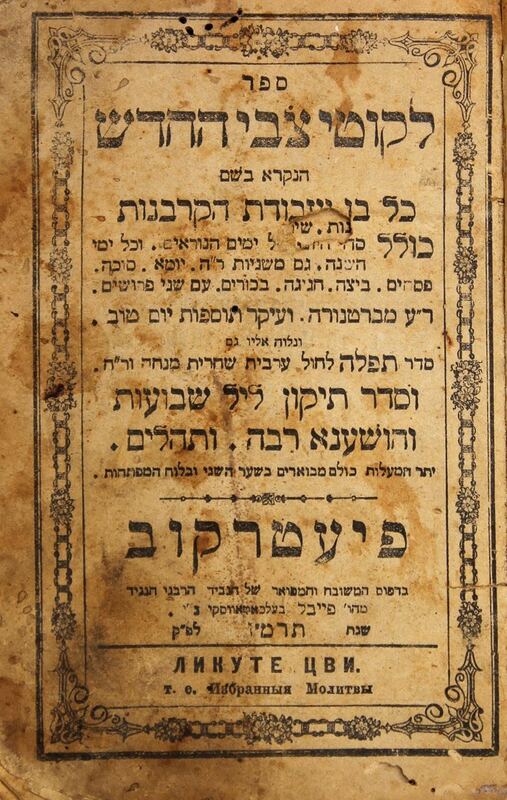 Siddur Likkutei Zvi, Pietrekov, 1889. Different sizes and conditions, generally good.